And yet it is hard to imagine a writer less suited to cinema. In his book Tolstoy or Dostoevsky, George Steiner makes a very convincing case of seeing Dostoevsky as carrying on the tradition of tragic drama and it is true that there are many scenes in his novels packed with dialogue and action. For some reason though these aren’t the scenes filmmakers seem to be drawn to. They seem much more interested in moments Dostoevsky transforms into great art through his manic, feverish narrative style – adaptations of Crime and Punishment being a prime example. Filmmakers also seem more interested in the writer’s life than his work. This combination has led to a number of adaptations of The Gambler, with the character of Alexei being seen as a stand-in for Dostoevsky along with there being a strong focus on the extreme circumstances under which the novella was written. 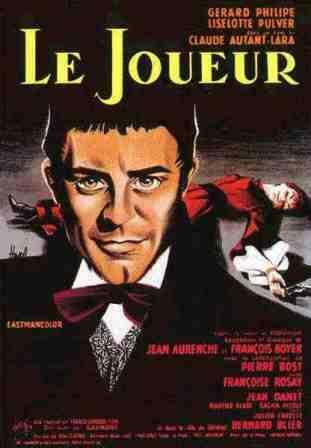 Le joueur (The Gambler) is a 1958 film starring Gérard Philipe in one of his last roles before his death at the age of 36. It is the only adaptation of the novella I have seen that tells the basic story without including the character of Dostoevsky. Unfortunately, Claude Autant-Lara’s film veers between melodrama and farce and includes some scenes that are unintentionally hilarious. One of these comes when General Zagorianski believes his rich aunt to finally be dead and does a Russian dance with some fellow officers. The scene comes off looking like a skit from Saturday Night Live and is only equaled by the inclusion of a cigar-smoking dwarf in the later casino scenes. One good trait the film has though is showing the clownish side of Alexei. Russian literature is often taken as so deep and profound that its interpreters and adapters miss out on the humor. Philipe, who had previously played Prince Myshkin in a film version of The Idiot, plays it with the right mix of boldness and masochistic self-hate. 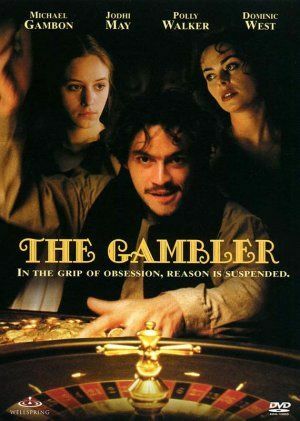 The Gambler by Hungarian director Károly Makk is a 1997 version starring Michael Gambon as Dostoevsky and Dominic West as Alexei. The story goes back and forth between the action of the novella and the drama of Dostoevsky having less than a month to write a novel for his publisher Stellovsky to avoid losing the rights to all his writing, including future novels. This is where the entrance of Anna Snitkina, stenographer and soon to be Mrs. Dostoevsky, takes center stage. The film ends up stressing how important it is for a wayward genius to have a strong, forbearing woman at his side, hardly the kind of main theme one associates with a Dostoevsky novel. The film almost becomes very good in the moment when the two stories intersect, with the actress playing Polina showing up at Dostoevsky’s door as the character on which she was based, Apollonia Suslova. This feature isn’t developed much though and after the initial surprise essentially fizzles out. That said, the acting is quite good though Gambon’s Dostoevsky seems less the famously irritable neurotic than a brash, larger than life Hemingway type. A young McNulty as Alexei, before the rough streets of Baltimore, alcohol and a failed marriage aged him, is also entertaining. Luise Rainer’s return to the screen after over 50 years to play the grandmother is worth seeing as well. Still, there is something about the 19th century that creates a monster of sweeping shots of beautifully-lit ballrooms, exquisite costumes and lush, symphonic music whether the story requires them or not. The end result is that films adapted from Dostoevsky, Jane Austen and Balzac all end up suspiciously similar, as if their writing styles were more or less the same. Giuliano Montaldo’s 2008 I demoni di San Pietroburgo (The Demons of St. Petersburg) suffers from this same cinematic trap. Though generally grittier than the other versions there are scenes where the cinematographer and set designers seemed to have forgotten about Dostoevsky altogether. There is a police interrogation scene where the golden light illuminating the police station gives it an absurdly heavenly glow. And their attempts to show the Petersburg slums look as fake as the typical studio sets of Victorian poverty in a Dickens or Sherlock Holmes film. The film isn’t really an adaptation of The Gambler at all, but takes the same story of the book’s composition and the meeting of Anna with Dostoevsky, and combines them with a story of the writer learning of a terrorist assassination plot. Serbian actor Miki Manojlović, the lead in many Kusturica films, is an excellent Dostoevsky – brooding, with simmering rage – and is a pleasure to watch. Ultimately this film, though entertaining, is no more Dostoevskian than the other two, merely using his life as a source and backdrop for a story idea that fills the two-hour space requirements of a feature film. For an artistic treatment that combines Dostoevsky’s life and work nothing comes close to Leonid Tsypkin’s Summer in Baden Baden. Some other versions of The Gambler I haven’t seen yet: The Great Sinner starring Gregory Peck and a 1938 German film (Der Spieler) directed by Gerhard Lamprecht (who seemingly did a French version of the book with a different cast that same year) with Polina (called Nina) played by the infamous Czech actress Lída Baarová. The film premiered just as Hitler finally put his foot down on Goebbels’ affair with the Czech actress and sent her back to Prague. After three days in theaters the film was pulled, not being screened again until 1950 under the title Roman eines Schwindlers (Novel of a Swindler).